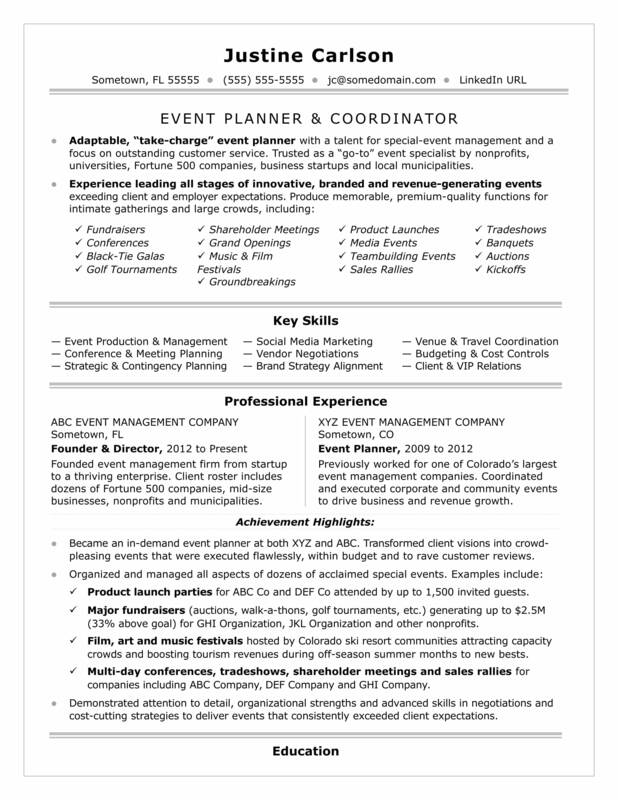 View this sample resume for an event coordinator, or download the event coordinator resume template in Word. Creating a winning resume is like arranging the perfect party—all the pieces must be in their proper places. To be considered for top event coordinator jobs, resume expert Kim Isaacs says it helps to have a comprehensive resume. For resume writing tips, view this sample resume for an event coordinator that Isaacs created below, or download the event coordinator resume template in Word. Jobs for event coordinators are projected to grow by 11% (or 12,700 jobs) from 2016 through 2026, which is faster than average, according to the Bureau of Labor Statistics (BLS). You'll find the highest level of employment for this job in the following states: California, New York, Texas, Florida, and Illinois; and in the following metropolitan areas: New York City, Washington D.C., Los Angeles, Chicago, Denver, and Seattle. As an event coordinator, you can expect to earn a median wage of $48,290 per year, or $23.22 per hour, according to the BLS. Additionally, you can search for event coordinator jobs on Monster. Adaptable, “take-charge” event planner with a talent for special-event management and a focus on outstanding customer service. Trusted as a “go-to” event specialist by nonprofits, universities, Fortune 500 companies, business startups and local municipalities. Founded event management firm from startup to a thriving enterprise. Client roster includes dozens of Fortune 500 companies, mid-size businesses, nonprofits and municipalities. Previously worked for one of Colorado’s largest event management companies. Coordinated and executed corporate and community events to drive business and revenue growth. Became an in-demand event planner at both XYZ and ABC. Transformed client visions into crowd-pleasing events that were executed flawlessly, within budget and to rave customer reviews. Product launch parties for ABC Co and DEF Co attended by up to 1,500 invited guests. Major fundraisers (auctions, walk-a-thons, golf tournaments, etc.) generating up to $2.5M (33% above goal) for GHI Organization, JKL Organization and other nonprofits. Film, art and music festivals hosted by Colorado ski resort communities attracting capacity crowds and boosting tourism revenues during off-season summer months to new bests. Multi-day conferences, tradeshows, shareholder meetings and sales rallies for companies including ABC Company, DEF Company and GHI Company. Demonstrated attention to detail, organizational strengths and advanced skills in negotiations and cost-cutting strategies to deliver events that consistently exceeded client expectations. As an event coordinator, you know the importance of getting details just right. The same holds true for your resume—all the pieces need to be in place in order for it to bring you success. Not sure your resume is ready for a job search? Get a free resume evaluation today from the experts at Monster's Resume Writing Service. You'll get detailed feedback in two business days, including a review of your resume's appearance and content, and a prediction of a recruiter's first impression. You work hard to bring people happiness; let Monster's experts do the same for you.